German chancellor Angela Merkel and Greek prime minister Alexis Tsipras are happy with a short-term fudge, IMF managing director Christine Lagarde wants a longer term solution. Brian Caplen assesses the dilemma facing the troubled southern European country. Leaving aside the prospect of the total collapse of the Greek economy there are two directions the Greece bailout programme can now take – the IMF’s way or Germany’s way. The IMF way would involve much tougher reforms and more substantial debt write downs. As with all IMF programmes, it would be designed to place the economy on a sustainable footing and it would take a dispassionate view about the repayment of creditors (apart from the IMF, of course). By comparison the approach of the European Commission (although this mainly seems to revolve around Germany’s stance as the major financial contributor) is to 'extend and pretend'. Instead of debt write offs, we get maturity extensions because it is politically difficult to tell German taxpayers the truth – that they have lost even more money in Greece than they think they have. The Greek government seems to believe that it can fudge unpopular reforms in exchange for German extend and pretend. That’s why Greek government officials reacted angrily to revelations contained in a leaked discussion between IMF officials about their frustrations with the European Commission and Germany over the bailout programme. Greek prime minister Alexis Tsipras accused the IMF of pushing Greece towards default by threatening to walk away from the next part of the bailout programme if the organisation was unhappy with the terms. This would create huge problems for Germany’s chancellor, Angela Merkel, as the German parliament, the Bundestag, is unlikely to agree to a deal on Greece without IMF involvement. Earlier in the conversation, the head of the IMF mission to Greece, Delia Velculescu, complains about “the Europeans backtracking” on reforms in Greece. The problem for the IMF is that the organisation is being asked to treat Greece in a different way than it did to other countries in trouble. The IMF’s increasingly vocal and powerful emerging market shareholders have questioned as to why a European country should get preference from the terms that were meted out to Asian countries during that region’s crisis in the late 1990s. Indeed to be involved with the Greek bailout programme at all the IMF had to change its approach in terms of both debt write off and reform on the basis that economic failure in Greece would jeopardise the entire eurozone. But this option is unlikely to be viable a second time. Yet in the long term, Greece can only fully recover under the tougher approach of the IMF, although it will definitely be in for more hard years as the reforms bite. 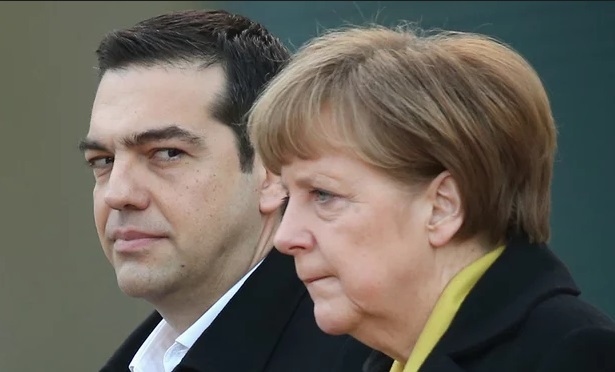 Both Greece and Germany are choosing the easier short-term fudge over the more painful long-term solution, albeit for different political reasons. It is easier for both administrations to sweep the problems under the carpet and let a future generation sort them out. By contrast, the IMF will get the problem fixed once and for all and allow a younger generation of Greeks to grow up in a country that is not always on the brink of disaster. Αναρτήθηκε από Unknown στις 5:57:00 μ.μ.